Miller Lite sponsors Nascar driver Brad Keselowski, and today the brand is announcing a digital cause-marketing campaign, "Get on the 2," giving racing fans the chance to appear on his car. Through March 31, consumers of legal drinking age can submit images of their "Miller Time Moments" (that is, snapshots of themselves enjoying events with friends and family) to a microsite. For every submission, Miller Lite will donate $2 (Keselowski's car is No. 2) to the driver's Checkered Flag Foundation, up to $22,222. The photos will eventually form a mosaic and appear on Keselowski's Ford Fusion during Nascar's May 18 all-star race in Charlotte, N.C. The crowdsourcing initiative comes two days before Keselowski's appearance in the Daytona 500, which he won last year in memorable fashion. The 29-year-old tweeted photos from 2012's competition while the race was halted during a fuel fire. He also responded to fans' questions and provided real-time updates during the delay via Twitter. Since Keselowski picked up 100,000 new followers in around two hours, it was heralded as an evolutionary moment in the sport's social media history. The race was delayed until the following day and garnered big TV ratings, with the Miller Lite-branded driver taking the checkered flag. Recently chatting with Adweek, Keselowski said it's unlikely that he'll hit such speeds on Twitter again. "Those moments are real and authentic, which makes them hard to come by," he said. "But I think it signals what's coming in the future. The moment itself isn't so much to be celebrated as much as the overall movement—being more interactive with fans." 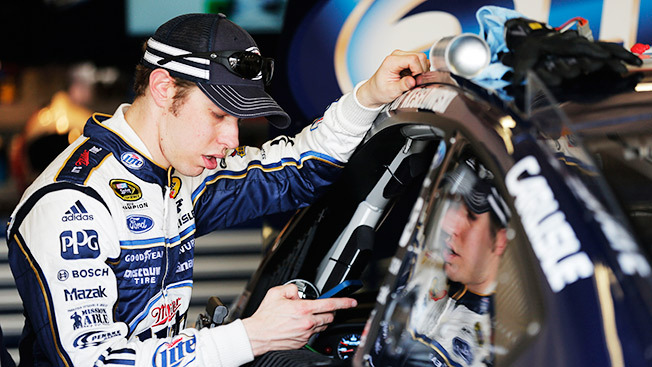 Keselowski is practically a social media maven these days, tweeting 200 to 300 times a week. Fans have even taken to inquiring about his well-being if he fails to send a Twitter message for several hours. If mobile technology drastically improves and with Google Glass possibly on the horizon, does Keselowski envision ever tweeting during an actual race? "I don't think so," he said. "I think the line in the sand for me is when the car is running and when it is off." Meanwhile, the driver said his focus going into Sunday's million-dollar race is pretty simple. "I have been in three Daytona 500s and wrecked in every dang one of them," he said. "So what's going through my mind is, don't wreck [laughs]. I didn't really have control over two of them, but the third one I did. Other than that, I am thinking, if I am going to cause the wreck, I don't want to be in it." If Keselowski is sidelined, you might want to check his Twitter account for updates.